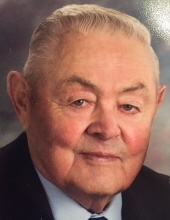 Martin Schreiner,87, of Remsen, Iowa and formerly of Maurice Iowa, entered into eternal life, surrounded by his family on Monday November 19, 2018. Mass of Christian Burial will be 10:30 a.m. Monday, Nov. 26, 2018 at St. Mary’s Catholic Church in Remsen with Father William McCarthy officiating and Father Chinna Devaraj concelebrating. Burial will follow in St. Mary’s Cemetery in Remsen, IA. Graveside military honors will be conducted by V.F.W. Post 3328 and American Legion Post 220 of Remsen. Visitation with family present will be 4-7 p.m. Sunday. There will be a parish rosary and vigil prayer service all at 5 p.m. at Fisch Funeral Home & Monument in Remsen. Martin was born on May 18, 1931, in Remsen Iowa. He was the son of John P. and Katherine Schreiner. He attended St. Mary’s Catholic School in Remsen, Iowa. Martin served in the U.S Army from January 19, 1953 to December 1, 1954, in Korea. During his enlistment, one of his fondest memories was making several trips delivering toys and supplies to the orphanage in Korea, which gave him great joy. After returning from the service, he married his sweetheart, Marie Stodden on January 14, 1956. He started farming in the Remsen and Maurice area until 2015, at which time he retired. In 2018, he and his wife moved to Bavarian Meadows in Remsen Iowa. Music, dancing, playing cards, and fishing were some of his greatest passions. Martin had a special talent playing his accordion to entertain his family and friends. He was grateful to share his life with his wife, Marie of 62 years, his children and their spouses. Shyrl (Rick) Hoag of Moline, Illinois; Susan (Michael) Mitchell of Waukee, Iowa; Larry (deceased); Daniel (Dee Ann) Schreiner of Atlantic, Iowa; and Linda (Tony) Rohlk of Sioux Center, Iowa, along with 12 grandchildren; Nichole Lee, Dennis Lee, Nicholas Loehr, Ethan Schreiner, Sarah Schreiner, Mark Schreiner, Christopher Loehr, Matthew Mitchell, Ashley Rohlk, Jordyn Rohlk, Emily Schreiner and Josh Mitchell. He was preceded in death by his parents, John P. and Katherine Schreiner; a son, Larry Schreiner; mother and father-in law, Francis and Sophie Stodden; two brothers and two sisters John, Roland, Elizabeth, and Mary. To send flowers or a remembrance gift to the family of Martin Schreiner, please visit our Tribute Store. Visitation with family present will be 4-7 p.m. Sunday. There will be a parish rosary and vigil prayer service all at 5 p.m. at Fisch Funeral Home & Monument in Remsen. "Email Address" would like to share the life celebration of Martin Schreiner. Click on the "link" to go to share a favorite memory or leave a condolence message for the family.